From the tiny bit I’ve seen so far, publishing seems a little more old-fashioned than some other industries, with deals moving forward based on one’s word and a (virtual) handshake. For example, news of Harper Voyager acquiring Polaris Rising was announced well before the contract was officially signed. In fact, the deal was announced before I even saw the contract. I knew the overall terms, of course, but the nitty gritty details were hashed afterwards by my agent and the publishing house. Last week I received the super-duper-official signed contract and my very first advance check! I’m officially a Harper Voyager author! It still feels a little unreal and I can’t believe how incredibly lucky I’ve been. 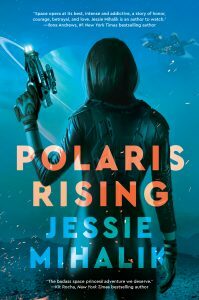 I also got the initial edits back from my editor, so the next step is for me to dive back in and make Polaris Rising even better! Congratulations. I can wait to read your book. Absolutely wonderful news! I eagerly await your publication! Wonderful news, congratulations! It’s far more than luck though, you’re such a talented writer. I also know that even talent is not enough so there’s an awful lot of hard work honing that talent , so you definitely deserve this. ? I’m a fan from the excerpts, I’m so looking forward to the book, and then the series. ? Wish i could have sent a gify to express how happy i am & how much I’m looking forward to finally reading the end product…or any excerpts you blog! Congratulations once again!!?? Congratulations!! I have enjoyed the snippets you’ve posted so definitely think this will be a fab book! Good luck with the edits!! Thank you all so much! I truly appreciate your support and enthusiasm. You guys are the best! ?